Photo by Nick Kernick from the Torontoist Flickr Pool. Toronto’s first major snowfall of the year usually results in collisions on city streets and highways. But icy sidewalks have also been an ongoing problem—and a recent study shows the effects they have on both pedestrians and local hospitals. According to a report released by Toronto Public Health in October [PDF], between 2006 and 2015, nearly 30,000 people went to the emergency room after falling on ice or snow, and 2,800 were hospitalized. These slips and falls cost the city about $6.7 million per year in liability claims, and cost the provincial healthcare system almost $4 million annually. Between 2006 and 2015, there were 2,300 claims against the city due to slips and falls on snowy and icy sidewalks. Dr. David MacKinnon is the deputy chief of the emergency department at St. Michael’s Hospital. During the winter, he sees patients who have broken their ankle or wrist in a fall on a sidewalk that wasn’t cleared or salted properly. Even MacKinnon has experienced this. He usually takes the TTC to work, or walks in the PATH system, but one snowy Monday morning, when he walked out of his house and onto the sidewalk, he slid three feet on the ice. On Sunday, Dec. 11, MacKinnon worked in the hospital’s ambulatory area—where a lot of patients with ankle and wrist fractures go, and he worked in the “acute” area (non-ambulatory) on Monday, Dec. 12, when most of southern Ontario was hit with about 15 centimetres of snow. Over a 24-hour period between Sunday and Monday, 17 people were treated for falls, but only one was due to ice, according to St. Michael’s. MacKinnon says one of the doctors working in the ambulatory area that Monday told him there weren’t as many patients with ankle and wrist injuries due to ice this year as there has been after the first snowfall in years past. In its report, Toronto Public Health made five recommendations. 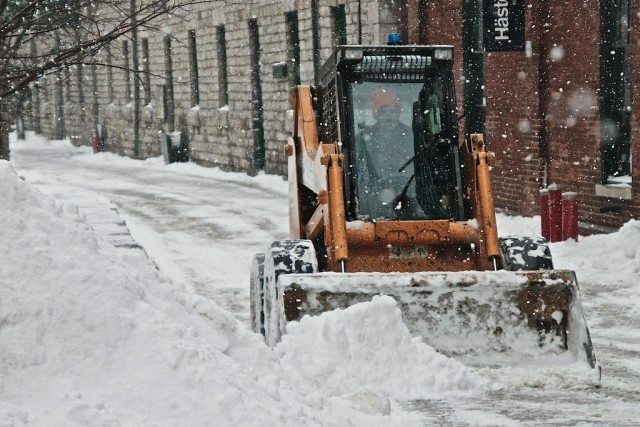 One is to decrease the threshold for sidewalk snow clearing from eight centimetres to two centimetres in areas where mechanical sidewalk clearing—using a plow—is available. Photo by *CityPines* from the Torontoist Flickr Pool. During November and April, the city clears high-traffic pedestrian sidewalks (arterial roads, school zones, and transit areas) after eight centimetres of snowfall. But in the typically snowier months of December, January, February, and March, it clears these sidewalks after two centimetres of snow falls. However, low-volume pedestrian routes, such as collector roads and local roads, are cleared after eight centimetres has fallen. It can take about 13 hours for high- and low-traffic sidewalks to be cleared after a snowfall, and up to 72 hours, depending on the severity. Transportation Services has indicated to Toronto Public Health staff that high-traffic areas are its first priority when it comes to snow clearing, says Monica Campbell, director of healthy public policy at Toronto Public Health. But Campbell says if eight centimetres of snow has already fallen before clearing takes place, walking on the snow compacts it, which makes it more difficult to remove and then it becomes a slippery surface. A resident must “clear away and completely remove snow and ice from any sidewalk on any highway in front of, alongside or at the rear of the building,” within 12 hours of a snowfall, or else risk a $100 fine (and $25 surcharge), as per the Municipal Code. 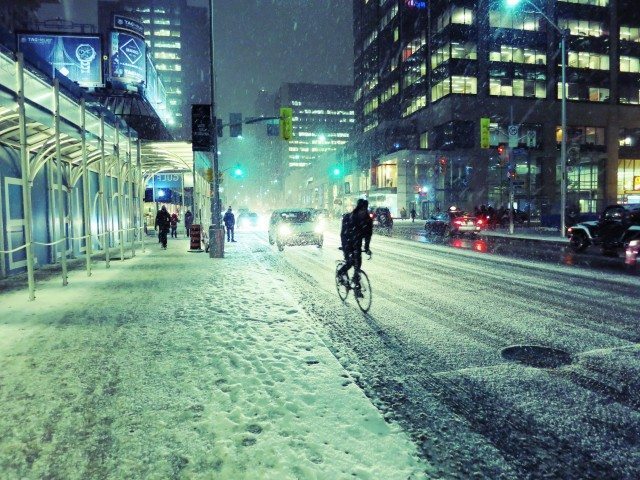 Within the city, about 6,000 kilometres of sidewalks, 5,600 kilometres of roads, and 9,500 streets need to be cleared when it snows. 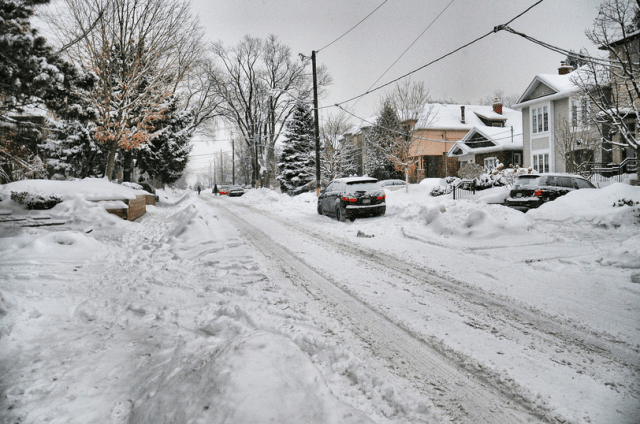 This season, Toronto has budgeted $94 million to clear snow from roads and sidewalks. The city sees about 130 centimetres of snow per year, and the City has about 600 plows, 300 sidewalk tractors, and 200 salt trucks. It uses roughly 130,000 to 150,000 tonnes of salt in a typical winter. Councillor Stephen Holyday (Ward 3, Etobicoke Centre) is a member of the public works and infrastructure committee. The city’s board of health forwarded its report to the committee in October. Holyday says one of the things the report “implied” was, if the City increased its service level, there may be fewer slip and fall claims. If the city increases the standards for the maintenance of the sidewalks—for instance, more salt—Holyday says it could bring more concerns from pet owners, as well as negative environmental effects. Every winter, his office receives complaints from pet owners regarding the large amounts of salt poured onto city sidewalks, which can be hard on dogs’ paws. Photo by -sina- from the Torontoist Flickr Pool. Road salt does have an adverse effect on freshwater ecosystems, soil, vegetation, and wildlife, according to a five-year assessment published in a report by Environment Canada in December 2001. In April 2004, the Code of Practice for the Environmental Management of Road Salts was published under the Canadian Environmental Protection Act, 1999. Its objective was to protect the environment and promote road safety through better management. Public entities that utilize 500 tonnes of road salts every year or more or have “any environmentally vulnerable areas” were required to have salt management plan in place within a year of the official release of the code. Toronto’s Transportation Services completed a salt management plan [PDF] in 2002. It was put in place to minimize the quantity of salt used on roads by using “best salt handling practices” and new technologies to ensure it’s used as effectively as possible—while still ensuring the safety of motorists and pedestrians. In 2012, Toronto Public Health found that people living in walkable neighbourhoods in Toronto do more utilitarian walking, take transit more often, drive less often and shorter distances, and have lower body weights than those living in less walkable neighbourhoods. Sidewalk accessibility is crucial for pedestrians, and especially so for people with physical disabilities and parents with strollers. If the sidewalks aren’t plowed properly, pedestrians may opt to use the road instead, and that’s dangerous too. During the period the report examined, eight per cent of those who visited the emergency department after falls had injuries that were considered life-threatening.